Environmental Management System and Environmental Compliance Auditing - Tavares Group Consulting Inc.
is your organization prepared to transition? 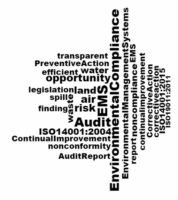 Tavares Group Consulting Inc. offers both internal Environmental Management Systems and Environmental Compliance auditing services to the meet the requirements of elements 4.5.5 (9.2.2) Internal audit and 4.5.2 (9.1.2) Evaluation of compliance of the ISO 14001:2004 (ISO 14001:2015) EMS Standard. Our lead auditor-certified team has over 25 years of industry experience and adheres to the ISO 19011:2011 Guidelines for auditing management systems. After the audit, your organization can expect a detailed audit report, linking to relevant section of the EMS standard or specific sections of environmental legislation, to ensure findings are easily understood. To increase efficiency, your organization may want to consider combining your internal EMS and compliance audits and ISO 14001:2015 gap analysis to develop an integrated audit program. To learn more about our internal audit services, read our projects below or contact us! Tavares Group Consulting Inc. has conducted internal Environmental Management System audits for various OEMs, first and second tier suppliers in the automotive industry, among other sectors, across Ontario, Quebec and northern United States. Our Environmental Management System certified Lead Auditors perform process-based audits in order to audit programs as a whole rather than a subsect of elements, providing our clients greater value. Our audit reports not only identify findings and recommendations for continual improvement, but also document areas of conformance and assesses the status and effectiveness of previous findings and corrective actions, leaving the client with a detailed audit record. Click here to learn more about our ISO 14001:2015 transition services. For more information, contact us. Emergency response and contingency planning. Our deliverable details the extent of the investigation and evidence, which points to the absence or presence of environmental concerns. Based on this review, a final audit report outlining identified and potential environmental non-compliance issues (linked directly to applicable legislation and regulations) in addition to summaries of instances of compliance is provided to our clients.